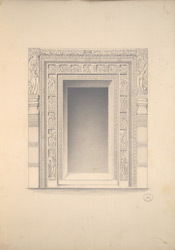 Pencil drawing of the entrance doorway of Cave 2 at Ajanta from an Album of 26 ground plans of the Ajanta caves and 16 folios of drawings of sculpture and architectural details in the Ajanta caves, by Capt. R.Gill, dated c.1850. The magnificent cave temples of Ajanta are situated in a horse-shoe valley of the Waghora river in West India and consist of prayer halls (chaityas) and monasteries (viharas), built for the Buddhist community who lived there. The first group was excavated between the second - first centuries BC; then, after a period of more than six centuries, the excavations restarted around the fifth century AD, in the Vakataka period. Cave 2 is a monastery from the late fifth century with profuse sculptural ornamentation. This drawing depicts the elaborate doorway to the antechamber; the pilastered jambs are ornate with jewelled bands and are flanked by carvings of figures of Buddha and Bodhisattva, amorous couples and friezes. The verandah of the cave is supported by pillars with fluted shafts ornamented with floral bands. At both end of the verandah there are small shrines. The hall has preserved some remarkable wall paintings depicting scenes from Jatakas about the previous lives of Buddha.